The end of an era in the US Auto industry — until $7 gas arrives. “Cars,” as the auto industry defines them, are going to die. 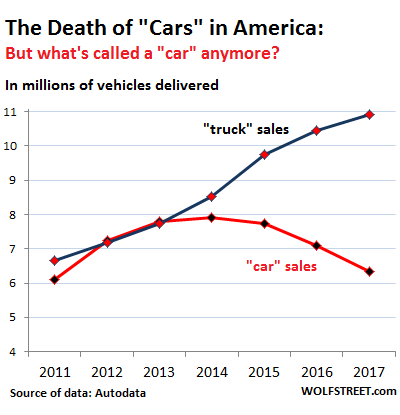 Not necessarily the vehicles, though they’re disappearing too, but the category of “cars” because sales have plunged beyond hope, especially for vehicles by the Big Three US automakers, GM, Ford, and Fiat-Chrysler. It came to a head today: Ford announced $25.5 billion in planned cost cuts by 2022 – some red meat it threw to its restive stockholders, whether or not these “cuts” will ever materialize. But the cuts included a big category that is a sign of the times: all current Ford car models, except the Mustang, will be killed off. This includes, in order of size, the Fiesta, the Focus, the Fusion, and the once dead, then revived, and soon dead again Taurus. After which Ford dealers will only have “trucks” on the lot and a few Mustangs. Part of the problem is that the industry’s division between “cars” and “trucks” is peculiar. “Trucks” include pickups, vans, SUVs, and compact SUVs (crossovers). But some SUVs and all crossovers are based on a unibody car chassis (instead of body-on-frame, which is the case with trucks). They’re stubbier versions of station wagons. For consumers, the switch from cars to crossovers is natural. And part of the problem is that consumers have fallen out of love with cars. Gas is cheap (though getting more expensive), SUVs and crossovers are cool and immensely popular. And in parts of the country, pickups have for decades been the most popular US-branded vehicle type, and that love affair has only increased in recent years. Including SUVs and crossovers, “trucks” accounted for 66.4% of total sales in March, the highest ever for a March. “Truck” sales have been above 60% of total sales for 21 months in a row. So today, Ford CEO Jim Hackett told investors the inevitable: there would be “a profound refocus.” Ford “will not invest in next generations of traditional Ford sedans for North America,” he said. And then the axe fell. The doomed car models will continue to sputter along in the near future, but without new investment, and then they will be phased out. Only the Mustang will survive, and a “compact crossover” called Focus Active, will be added next year. It will be very extremely car-like (but for crying out loud, don’t call it “car”; that would kill it). In terms of its Lincoln models, Ford was very economical with its announcement today and didn’t say a thing. But it already stopped making the Lincoln MKS (a fancy Taurus). The Lincoln Continental and MKZ sedans are unlikely to continue on their own since they share so many components with their Ford counterparts and are produced in only small volumes. Ford is not a trailblazer. Last July, GM entered into negotiations with the UAW about cutting six car models after the 2020 model year: the Chevrolet Volt (a hybrid, and not the Bolt, a true EV), the Buick LaCrosse, the Cadillac CT6, the Cadillac XTS, the Chevrolet Impala, and the Chevrolet Sonic. At the time, GM had already killed the Cadillac ELR, a dressed-up luxury 2-door version of the Volt. Fiat Chrysler has already stopped production of the Dodge Dart, the Chrysler 200, and the Dodge Viper. None of its remaining car models are made in the US. Other automakers have also cancelled cars over the past two years. Most notably, Toyota killed its entire Scion brand. Some models migrated to the Toyota brand and others, such as the Scion tC, just died. As automakers abandon cars, sales will plunge further. No one wants to buy the end of the line. And these plunging sales will be further reason to cut car models. A circularity will set in, sort of a death spiral. But some foreign brands will try to keep their car tradition alive, and they will develop new models and try to woo the finicky American consumer with real cars, and when gasoline costs $7 a gallon, suddenly they’ll have a bestseller on their hands, and the wailing and gnashing of teeth in Detroit will be heard all the way to Washington. Or motivated by this type of gas gouge, consumers will discover EVs as cost-effective alternatives. Going forward, I will no longer distinguish between “car” sales and “truck” sales. It doesn’t make sense anymore. It’s the end of an era, in terms of distinctions. It’s a hard thing to do, linguistically. I cut my teeth in the “car business,” as it was called confusingly, though we, in truck country, sold way more trucks than cars even back then before anyone had even come up with the terms SUV and crossover. GM already cut the third shift last year at its plant in Lordstown, Ohio, which builds the Chevy Cruze compact car. Now it cut the second shift.